I might as well get another entry written this morning while I wait for the snow to stop falling. After sanding all of the front leg parts and the back leg parts with 220 grit paper, easing the edges, but not rounding them over, I glued everything up. The pieces went together easily as I have dry assembled them several times. There aren’t a lot of joints to glue on either leg assembly which was also a big help. Generally, I let things dry over night to make sure the glue is well set. For you eagle-eyed readers, the pictures are from the 3rd chair which doesn’t have the same back back splat design as the Rodel version. More on that later (shameless teaser). 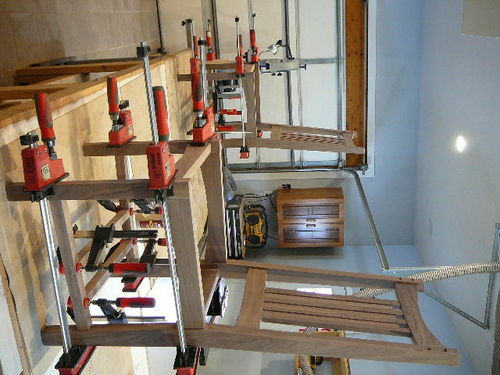 In order to get the lower stretchers properly set on the side stretchers the chair needed to be put together. Previously, I made the blanks for the loose tenons for the chair side rails and side stretchers, using 3/8” and 1/2” stock cut to width and then run across the appropriate quarter round bit. I made a test tenon to check length, and then cut enough for all of the chairs. The dry fitting allowed me to make sure they weren’t too long and fit snugly in the mortises. There are a couple of little surprises that popped up when I started looking at the layout for the stretchers. The first, and most obvious was the 85.5 degree flair that the sides have which means the cuts will need to be made taking that into consideration. 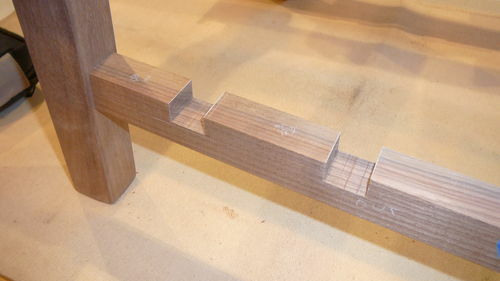 The second issue was with the half lapped dovetail joint that the plans called for. When I drew it out on the pieces, the socket on the side stretch looked lopsided due to the 85.5 degree flair. A simple half lap joint looked better. When everything was finished I also realized that the placement of the cross stretchers should have been moved further to the front than the plans show. To my eye, they looked off balance. Additionally, the cross stretcher is 1-1/8” thick and the side stretcher is 1-1/4” thick but the plans called for the top of cross stretcher to sit flush with the side stretcher. Had I cut the half lap into the bottom side of the side stretcher instead, the effect of the 1/8” difference between the pieces would have added a little more visual appeal. 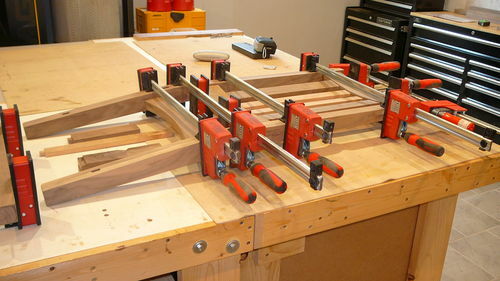 Cutting the half lap joints for the side rails was straightforward. The taper on the front edge was set against the fence and the miter bar was angled to meet it. I didn’t use the back edge since it has a compound mitered face. Since I have a couple of miter bars, I set one up for the left side, and one for the right side. Using a 1/2” dado stack I made a couple of cuts, sneaking up on the final width to match the cross stretcher width. For the other side stretcher, I did the same thing. It is very important to make sure you keep all of the pieces properly oriented since there is a left and right side, and both have a top and bottom face as well. In addition to laying out the cuts on the pieces, I laid the back assembly on the bench and put the side rails and side stretchers in their appropriate places and pulled the pieces off to cut them, and put each one back immediately after finishing the cut so I wouldn’t get them messed up. Measure twice, check three times, then cut once, after double checking everything. 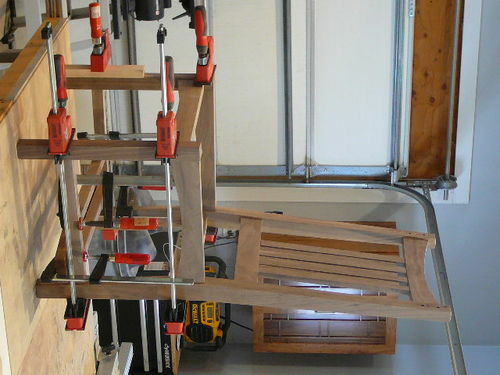 Once the side rails were finished, the chair was reassembled so I could cut the cross stretchers to fit. One end of the cross stretcher half lap was cut and fitted. The other end was marked where the cross stretcher intersected the other side stretcher and the half lap joint was cut into the cross stretcher. The piece was dry fit again and the excess on the end was trimmed. The process was repeated for the second cross stretcher. 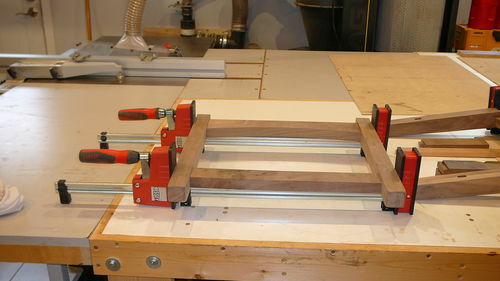 The pieces were sanded and the final glue-up was finished. 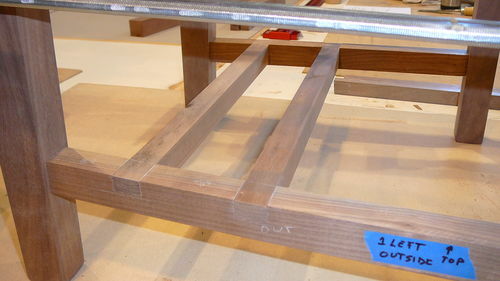 For an upholstered seat, a frame is screwed to corner blocks that mount flush with the front and back seat rails. A wooden seat would also attach to the chair frame in a similar fashion. The 2 chairs that I’m making following the plans will be upholstered if we can find an upholstery we like at the local furniture store that sells Stickley furniture. The third chair will also be upholstered. However, some of the details were changed to match the style of the Frank Lloyd Wright desk. The 4th chair will also have a different look to match the Mackintosh desk. It will also be ebonized before finishing. This should end the chair building series. Thanks for reading along and providing your thoughts, insights, and questions. I’m off to shovel snow for a while. Hey, Earl, thanks for posting this. It will be fun to see the 4 chairs in their entirety after they have been finished and the seats affixed. You are making great progress, looks awesome! Can’t wait to see them with finish applied. Oh that’s right, I forgot about the compound angle tenon on the back of the lower side rails. That must be the most challenging part. Looks like they came out great. I’ll be watching for the final project posting to check out the finish and upholstery. Thanks for doing the write-up on this build. i agree with all said,cant wait to see the final results. Very nice job, you are inspiring me to try something like this. Looks like upholstery will be 3-4 weeks to get the material and another couple of weeks to have a professional do the work. As expensive as Stickley upholstery is I’m not going to try doing it myself. I don’t blame you. I’ll be outsourcing my upholstery work as well when I get to that point. Stick to your knitting, as they say.